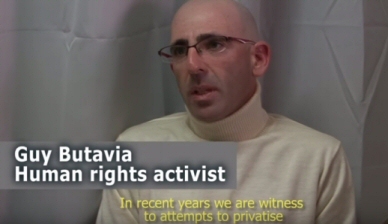 Guy Butavia is one of three activists, along with Ezra Nawi and Nasser Nawajah, who were arrested following a TV news show that depicted an inciting work made about them by extremist Israeli settlers. Police questioned Butavia on suspicion of conspiracy in attempted murder, as well as several other offenses, including accessory to manslaughter and passing information to a foreign agent. The three were released by a court without bail and without restrictions, claiming the accusations brought forward by the police were baseless.